Trooprock Aussies: Where big things start: The Big Banana! 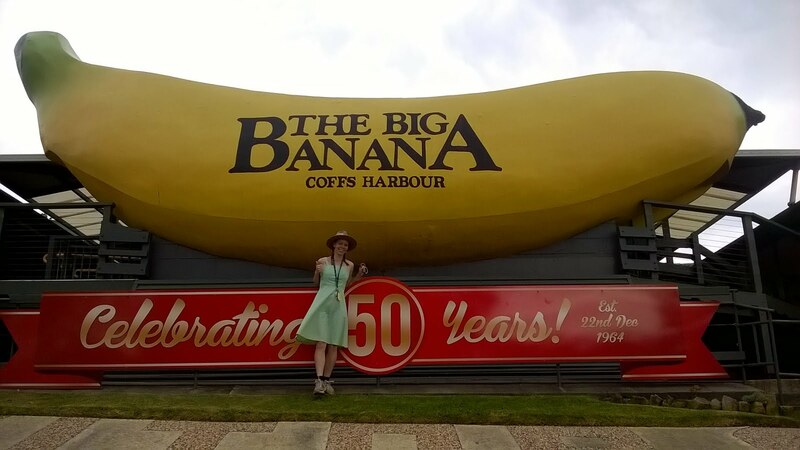 As a youngster I absolutely loved Coffs Harbour and the Big Banana was one of my favourite destinations. My first addiction was chocolate coated bananas and I was close to being hooked again after visiting the Big Banana again as an adult. A lot has changed at this place from my childhood, as a youngster I loved the monorail train type tour. Although the man eating plants did scare me a bit, as did the Bunyip (Who later motivated me to create li'l Bubba Bunyip!). These things are no longer part of the park today, but it is still very special in a different way. It still has a collection of the tastiest banana recipes and also a variety of attractions for everyone to enjoy. We quickly grabbed ourselves a "big bunch of fun" ticket each which gives us a nice taste of everything and is the best option if you want value for money. First up for us was the toboggan hill. Of the current attractions this would be one of the oldest, I have some fond (post bunyip) memories of playing on the toboggan hill with my brother, cousin, father and uncle. This time though I was a little heavier so went down a little faster, yeeha! After a couple of runs on the toboggan hill we changed into our swimmers and hit up the newly opened water slides. Was a nice hot day and a bit of slip and sliding was a good way to keep cool. From the top of the slides you get a nice view over the park. The park had 4 slides, 2 of which were nice and slow for the more timid whilst the other two were a little faster, of course we like to go fast! Turns out running up the hill and slipping down slides is quite hungry work, so after a good bit of slippin' and slidin' we returned to the cafe to grab some grub. We both decided to tackle the Big Banana Burger, which happened to be quite banana'ry and big! The burger was quite a mouthful and leaves you feeling quite similar to tackling an equally iconic Archer River Burger. With bellies full of energy it was time to hit the ice skating rink. Now this one was pretty exciting for me as I had never ice skated before! As we entered the building the temperature dropped from 35°c down to 15°c, ouch! Thanks to Blades of Glory, once I received the ice skates the very first thing I did was check the sharpness, they made a butter knife feel sharp! We strapped on our ice skates then walked over to the edge of the rink. There is the option to use a variety of zimmer frame like walkers to help steady yourself, but where's the fun in that? Jen glided across the ice like she last skated yesterday while I clung to the edge slippin' around all over the place. I had done some rollerblading in the past, but ice skating felt quite a bit different. After about 10 minutes I started lapping it up and once I felt comfortable on the blades began to pick up speed and have some fun. After a while we were keeping a good pace and playing dodge human as we blitzed around the rink. Thoroughly enjoyed it and keen to freeze over an ice rink again sometime soon! Afterwards we were both buggered! Decided it was time to take it easy and smashed a delicious Big Banana Smoothie, which was a bit much after having such a big burger for lunch! We took it easy for the rest of the arvo and decided to enjoy the rest of the Big Banana another day. On our second day at the Big Banana we went up for a couple of games of laser tag, then went to check out the Big Banana theatre. There we took in some interesting facts about bananas, the growing, harvesting and munching! 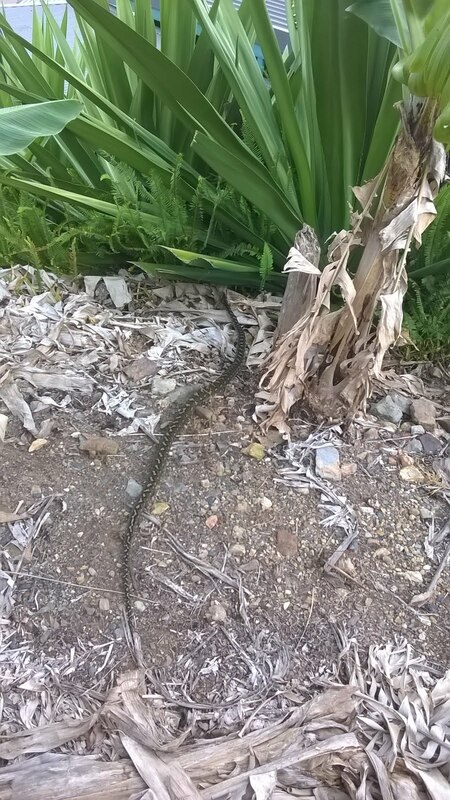 Out the back of the theatre is a small boardwalk through a part of the plantation, we were lucky enough to spot a large carpet python slither out from underneath us and into the scrub. 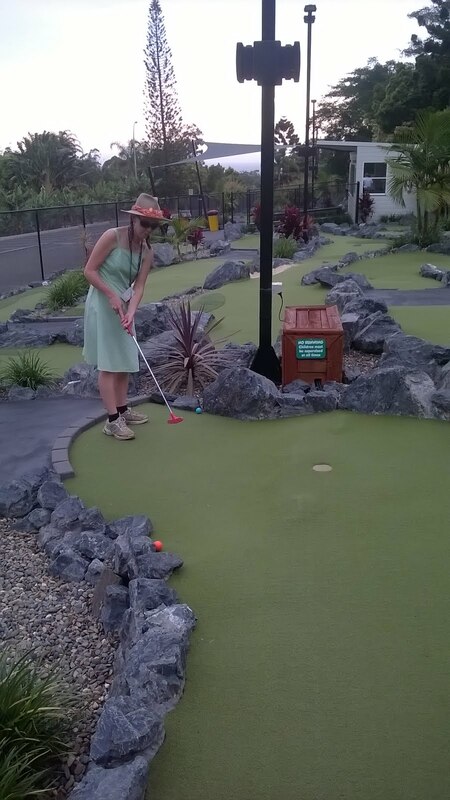 Last up to complete our big bunch of fun ticket was the mini golf. Neither of us are golfers, but Jen absolutely blew me out of the water, her score was about double that of mine! Once we had finished the 18 holes the weather had just given in and decided to shower us with rain, good timing to finish up a good adventure at the Big Banana! All in all the Big Banana is great fun! Nothing like it used to be, but well worth the time if you are up for a bit of fun!